GOODGOD Small Club ~ The Dip Presents HOT DOG DEG – A Hot Dog Degustation! 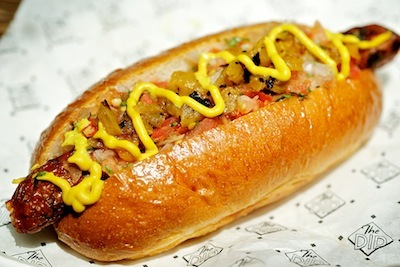 The Dip Presents HOT DOG DEG – A Hot Dog Degustation! After the popularity of our recent Valentines Day banquet, we’ve decided to hold another special evening to celebrate of our favourite menu items – the Hot Dog! Come down to The Dip on Thursday the 21st of March for a HOT DOG JOURNEY THROUGH AMERICA as we lay down 6 courses of mini hot dogs in different regional styles! From the pickly Chicago style to the spicy Coney Island style, the Mexican influenced Sonoran dog from Arizona and the deep fried dogs from Jersey – if you’re a hot dog fan this is a night you don’t want to miss. The Dip takes its hot dogs very seriously – get a group of your dawgs together and come eat some damn good dogs at our first ever HOT DOG DEG! Bookings essential: email do@thedip.com.au or call us on 9283 8792 to make a booking!